Build a bundle and get a cart of fresh new artwork for a limited time! **Choose 20 sets for $20 with code HELLOAPRIL** You can use the coupon multiple times until 4/14 only! Excludes licenses. 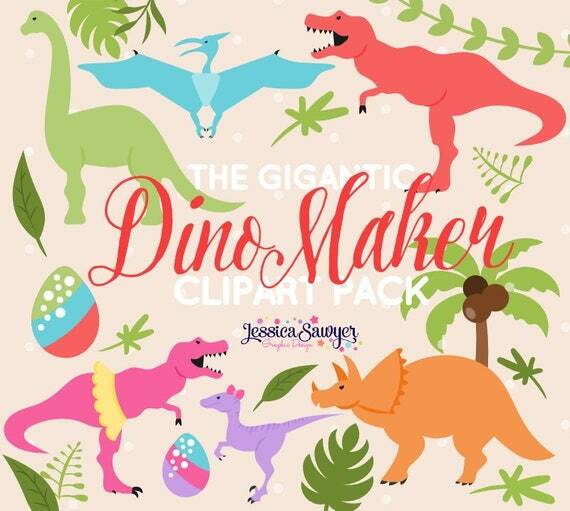 This HUGE set of dinosaurs includes everything you need to create the perfect dinosaur family or scene. It includes accessories and flora to customize your dinos as well as a premade set of bold colored dinosaurs and rainbow as well. EPS (vector, opens with Illustrator) Vectors can be recolored and you can choose any size. - Images are high quality, 300dpi, clean, crisp images. - Watermark will be removed upon purchase. - You will INSTANTLY receive a link to download your file once payment is received ( usually 5 minuets or less ). Okay for personal and small commercial use for both printed and digital products. You must credit www.jessicasawyerlol.etsy.com in your listing. All rights reserved. Purchase of Item does not transfer copyright.